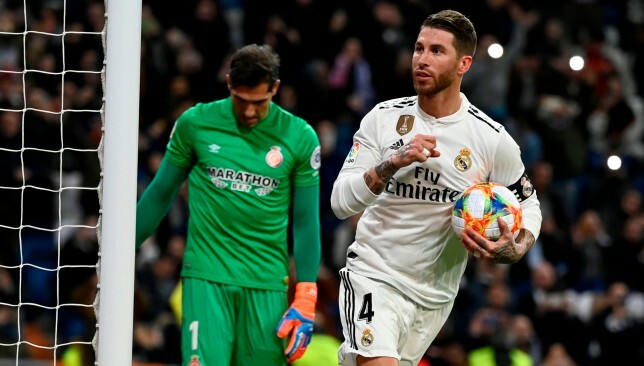 Real Madrid captain Sergio Ramos believes that his team can catch Barcelona or at least make life difficult for their rivals in the title race. A win over city rivals Atletico Madrid means that Los Balncos jumped to second spot in La Liga, within five points of league leaders Barca, who have a game in hand. “We fulfilled our objective to recover our position in the table and reduce the distance to the leaders and now we will wait to see how they do,” he told BeIN Sports. “It was very a complete performance from us and I think that the result is fair. I thought our performance was very intelligent and now the league is still to be fought for. “There are many points up for grabs and any team can cause problems, as was seen in the first half of the season. The defender scored Madrid’s penalty on Saturday to make it 2-1 and admitted that he likes to take the responsibility of the spot kick. A momentous day for Real Madrid and Gareth Bale saw a commanding 3-1 derby triumph earned at 10-man Atletico Madrid, with their Wales superstar moving into the hallowed 100-goal club in the process. Bale, 29, came off the substitutes’ bench in the second half and soon got on the score sheet with a trademark low finish across Jan Oblak’s net. This laser-guided strike into the bottom corner moved him into three figures in 217th appearances. Real’s recent rise under Santiago Solari continued at a hostile Wanda. Casemiro’s stunning scissor kick was levelled up before the half-hour mark when Antoine Griezmann beat the offside trap and shot through hate figure Thibaut Courtois’ legs. But Los Blancos responded in style to earn a sixth-successive La Liga win. Sergio Ramos converted a penalty prior to the break. In the second half, Bale made a telling impact and Thomas Partey was dismissed for two bookings. Memorable achievement: When Madrid paid Tottenham a world-record €100.8 million in September 2013, they expected a big return on their investment. True, Bale has not represented the second-coming of Cristiano Ronaldo. But only 14 other players in this grand club’s 116-year history have reached 100 strikes. When you consider 13 major honours, including four Champions League titles, then Bale can only be viewed as a success story. Frustrated feelings: And still, a sense of ennui surrounds Bale at present. This sharp conversion was just a sixth in 18 La Liga run-outs this term. He’s also been eased back from injury, starting just once in his last five matches. A lack of conviction was present in both his celebration of a historic goal, and snatched header that followed. With Madrid shining with Bale on the sidelines, his listlessness may continue. 74th min GOAL: So many of Bale’s 100 goals looked like this. Ex-Tottenham team-mate Luka Modric played a perfect pass into the channel for the onrushing Bale, who looks up and finds the bottom corner. Perfection. 88th min CHANCE: Lucas Vazquez sends Karim Benzema free down the right. The French striker then picks out Bale with a cross, but his poor header flies over. These are strange times for Bale at Madrid. This fine goal moved him into the upper echelon of representatives from Europe’s true heavyweight. 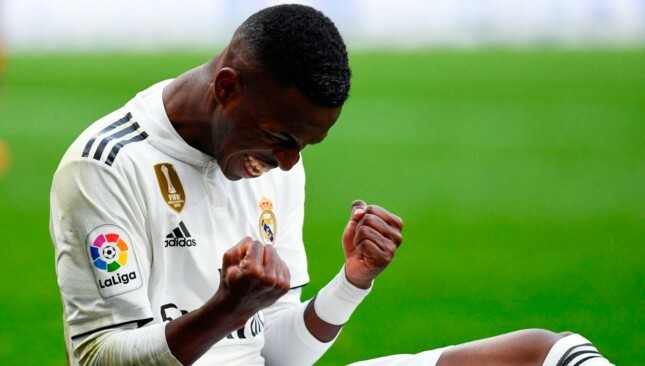 The startling recent emergence of Vinicius Junior and Real’s stellar run without him in the starting XI, however, has put him on the verge of irrelevancy. Bale must now build up his match fitness, hope he avoids another enervating calf injury and explode in the season’s defining fixtures to come. 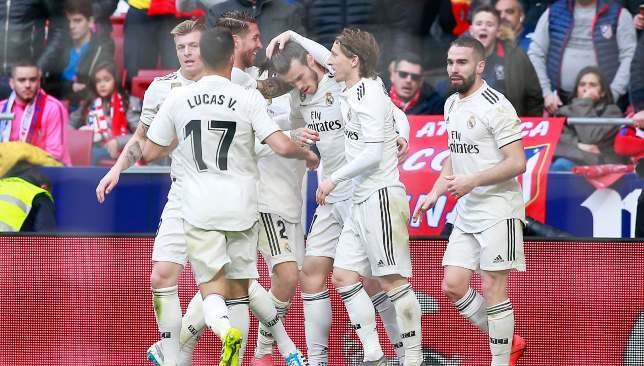 Real Madrid kept up their impressive form under head coach Santiago Solari as goals from Casemiro, Sergio Ramos and substitute Gareth Bale earned a 3-1 derby win at 10-man Atletico, usurping their city rivals into second place in La Liga. Brazil holding midfielder Casemiro delivered a 16th-minute scissor kick at a hostile Wanda Metropolitano, before France forward Antoine Griezmann soon burst past the offside trap – according to the video-assistant referee – and nutmegged hate figure Thibaut Courtois. A stellar response then followed to earn a fifth-successive La Liga win and make it just the second time Atleti had conceded three or more at their new home. The electric Brazilian teenager Vinicius Junior was felled by Uruguay centre-back Jose Gimenez and Ramos did the business with a penalty kick on 43 minutes. Into the second half, Wales superstar Gareth Bale came off the substitutes’ bench and fired in a punishingly accurate low finish to move onto 100 goals for Los Blancos on 74 minutes. Ghana midfielder Thomas Partey was then dismissed for a second yellow card to complete Atleti’s misery. There is one trait which defines and unites all the very best wingers – showmanship. You can debate whether Vinicius is more early-days Cristiano Ronaldo or Ronaldinho at Paris Saint-Germain, yet it doesn’t really matter because it’s that characteristic the Brazilian shares with them. He is pure theatre, the type to get bums in seats and then lift them right back off it with his licence to thrill. Yes, the teenager is still incredibly raw and there will be years of refinement to come, as evidenced by his dispossession in the lead up to Griezmann’s equaliser, but he owns that flair quality which heightens on a grander stage. For the Copa del Rey El Clasico clash, he made a telling impact and then in the Madrid Derby did so again. Two big games, two massive performances. Whenever he received the ball – and that was often – both the Wanda Metropolitano crowd and defence knew something was coming next, they just couldn’t figure out what. Mind, neither does he and that’s part his allure because Vinicus acts on such instinct, frequently veering off-script and into the penalty box. Sometimes that would lead to a misplaced pass or failed trick, but then he’d beat his man to earn a first-half penalty and before that deliver a gorgeous outside-of-the-boot cross to Lucas Vazquez. His ability to run at such searing pace and keep the ball under control stride for stride is quite something. Granted, he’s still a kid and it’s important to keep in mind he will not be perfect and mistakes will be made. He’s not even played half a season and isn’t established given he was substituted before the hour with Bale going on to remind everyone of his talent. Yet that doesn’t mean we shouldn’t sit back and enjoy the Vinicius Show. He certainly seems to enjoy performing that’s for sure. The careers of Diego Simeone and Santiago Solari are very much entwined. The compatriots have both played for Atletico and Inter Milan, turned out for their national team and have long called the city of Madrid their home. Solari even played under Simeone towards the end of his playing career when the pair were at Argentine club San Lorenzo back in 2009. Fast forward a decade and the two now stand next to each other on the touchline. The similarities end there, though. Simeone has a very indifferent record against Real and Barcelona. He owns just two wins against the Blaugrana from 24 games in all competitions and his record versus Real is no better with only nine wins from 29 fixtures. Solari handed him an 11th defeat and through two games against Real’s biggest rivals, he’s started strongly given he’s unbeaten. Their philosophies are a huge contrast as you might expect and that’s ultimately what made the difference in the derby. 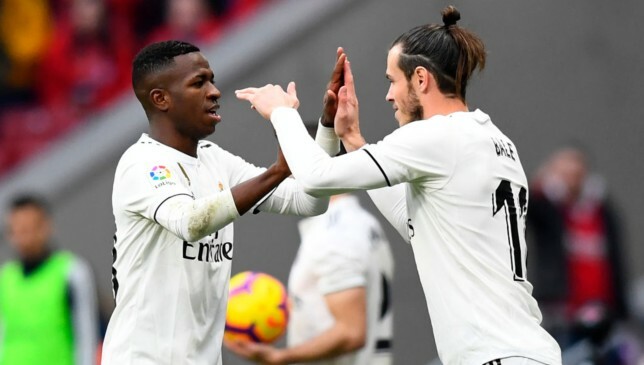 In recent weeks, Los Blancos have been super slick in the final third, stepping up the tempo of their passing and lessening their touches, too. There’s a clinical edge to them and a clear plan. 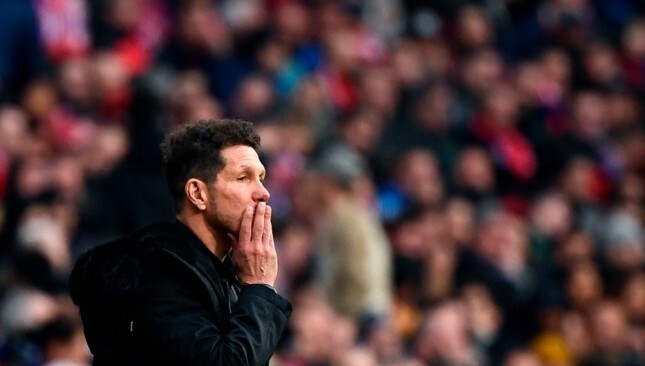 With Simeone, his side still struggle to attack the top teams and when their defensive wall crumbles as it did on Saturday, he can’t rebuild. This is not to say he’s lost his touch, but his friend has done him no favours. A home debut for Alvaro Morata which contained the odd paradox of everything and nothing. There was a horribly sliced effort when in threatening space, a caution for diving and a sublime touch and lobbed finish which was then ruled out for offside. To his credit, the 26-year-old looked to gain confidence from his chalked-off goal and that will please Atletico supporters going forward. Before then, though, he was largely anonymous, struggling to make any inroads or strike up a telling link with Griezmann. This loan move to Atletico really does feel like Morata’s final chance at a truly elite outfit and on the basis of this performance, there’s so much more required from the striker. Instilling him with conviction and confidence is the obvious place to start and Simeone must pass on some of his trademark fire to the Spaniard. He’s like that boyfriend a daughter brings home to parents when initially he seems like such a great guy, then turns out to be a massive disappointment. 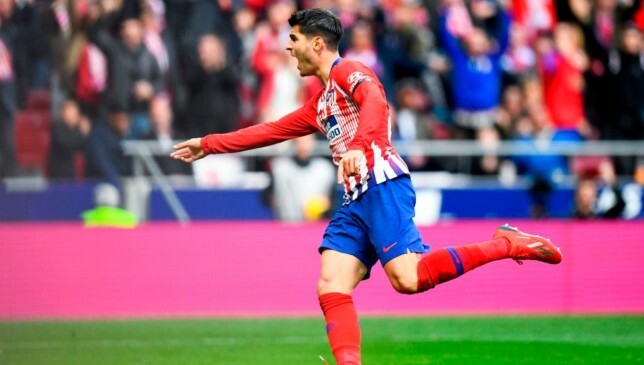 The fact he celebrated an offside goal against his ex just about sums up Morata, as does the statistic of Atletico’s 18-match unbeaten run in the league leading to straight defeats in the two games he’s started in.